The Litter Box: Happy Easter Everyone! When you hear the word Easter what usually comes into your mind? Well, there's Easter Egg painting and hunting, aside from that it's also a great time for your family and friends to get together to celebrate and then there's the fact that Easter is actually the end of the Lenten Season and the time when Jesus Christ rose again from the dead. Technically, Easter is supposed to be celebrated and it is supposed to be a happy event for all of us. I remember when I was younger, I used to see people who dressed up and pretended to be people who lived in the olden times. They simply re-enacted everything that happened to Jesus Christ during his time. I remember covering my eyes whenever I saw people who had to hit their backs with something sharp to make their backs bleed. They say it is their way of penance, a way of them sacrificing just like Jesus did, it is their way of attoning for their sins. I was too young to understand back then. Furthermore, I felt pity on the man or sometimes even the woman who portrayed Jesus Christ since they had to carry a big cross everywhere and they had to sacrifice as if they were actually being punished. 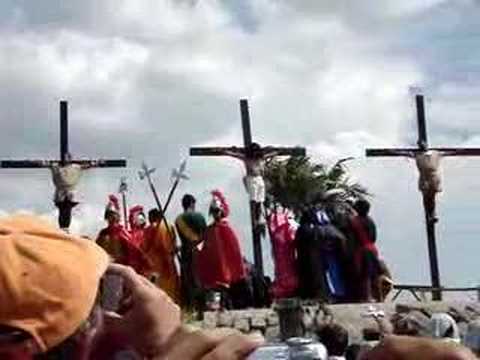 Some devotees who play the role too seriously even devote their time to actually be nailed in an actual cross. I do not want their efforts to just be disregarded even if I feel the need to ask why they do such a thing but who am I to question their faith? This Holy Week we decided to just visit some relatives and spend time there. We had a small feast and we ended up painting some Easter eggs before the actual Easter egg hunt happens. We also saw some of our relatives whom we haven't seen in a long time. I feel happy and blessed to see that I was able to celebrate Easter in a fun and religious way. I wish I can do the same thing next year or perhaps I can even take part in the stations of the cross. I am open to these things. I just wish I'd be able to do them in time. Until then, Belated Happy Easter everyone! I hope you all had fun somehow. “Senakulo” (Passion-play) is a traditional dramatic presentation depicting the passion of Jesus Christ — His trial, suffering and death. 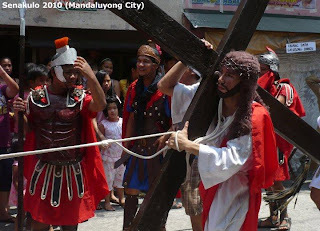 It is done in towns and cities during Holy Week. People gather in town plazas or churchyards to witness this holy event. Actors and actresses playing in this passion-play do this not just for entertainment but also as their means of “panata” (vow). Some people who do passion play even take their vows to the extreme by letting other people actually nail them to the cross as if depicting Jesus Christ's actual crucifixion to the cross. It is a painful process that they have to go through but to those people who are devoted to God and their faith, nothing is possible and pain can be tolerated because they know that God will never forsake them. 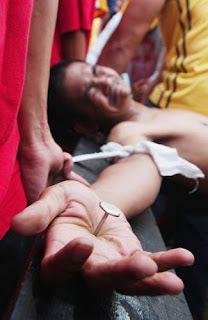 Then there is Penitensya - It is a tradition wherein sinners cover their faces and beat their bare backs with glass spiked leather thongs while walking on the streets in order to under go the same suffering as Jesus Christ. They do this in the belief that what they have done wrong will somehow be forgiven. True or not, who am I to question their belief? Lastly, here's a photo of some of the Easter eggs that we enjoyed painting a day before Easter. Some of them look odd but some of them look good. Nonetheless, we still enjoyed coloring them and I am sure the kids and adults enjoyed looking for them and gobbling them up the next day.